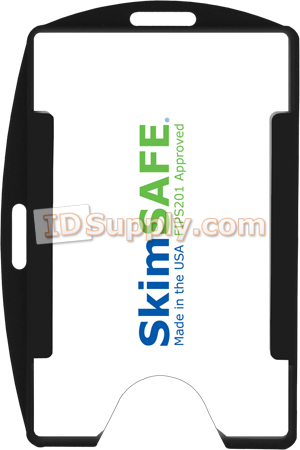 HPF039 SkimSAFE™ RFID Shield Dual Card with open face design. Max Insert: 2-3/8" x 3-7/8"
RFID cards are gaining popularity in the USA. Protect yourself from hackers and data thieves with our RFID-shielded badge and card holders. They block signals to and from your documents while they are in the holder. Just slide the card or badge out to scan it, then slide it back in to protect your encoded information. SkimSAFE™ protects all 13.56 MHz and UHF RIFD cards. Cards using 125 kHz range are not protected.